Some of you might remember that I am an official ambassador for Bake Box - the bakeware subscription box that is delivered to your door every other month. If you'd like to hear more details, prices and see how I got on with my first two boxes you can read my review here and here. The fruits of my labour from my last Bake Box was this amazing polka Teddy Bear Cake which I baked with Bert shortly after Connie's arrival. It was such a fun cake to make and turned out to be a proper showstopper...how could I top that? 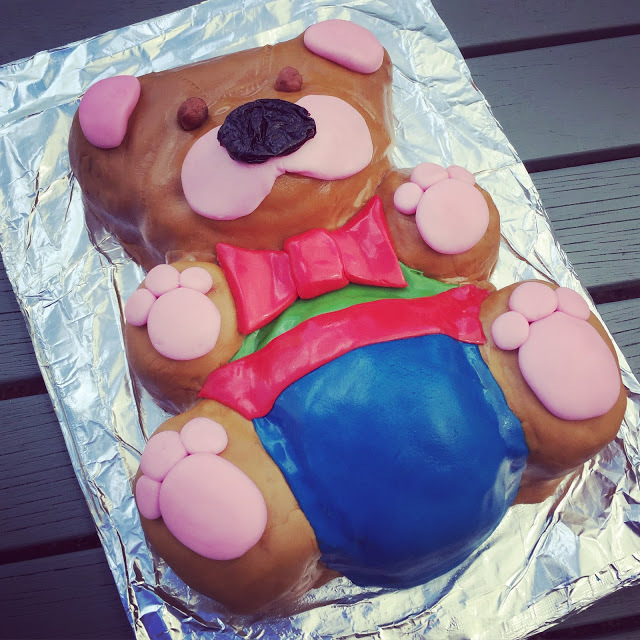 The fruits of my second Bake Box - A Teddy Bear cake baked with The Bertster. Well, this month (September) I decided to choose a crowd-pleasing recipe from the box, one that I knew would go down a storm with various 'taste-testers' who I was seeing over the course of a few days last week: three lovely friends, my Mum, Sister and Stepdad and of course, Liam and Bert. 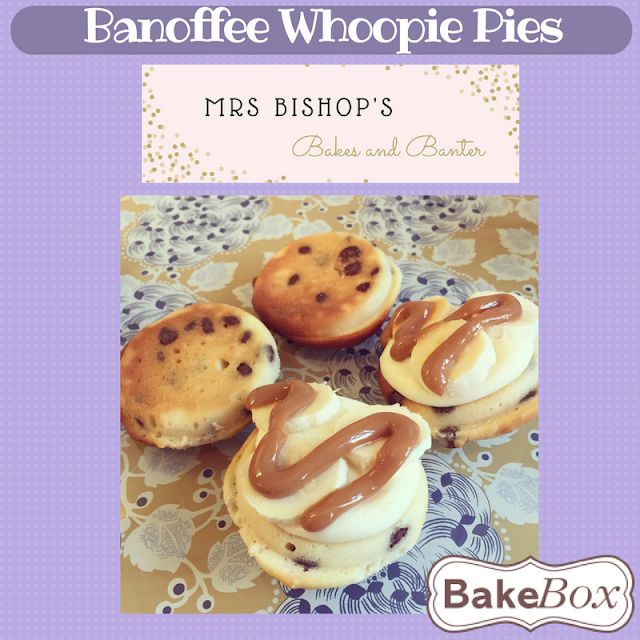 The recipe I chose to have a bash at was Banoffee Whoopie Pies, and I used the whoopie pie mat which came as part of the latest Bake Box. This was my first attempt at a whoopie pie recipe - I've seen a real influx of these in recent years - much like the beloved cupcake a few years ago, they seem to be to new 'in-thing' in the UK baking scene...if you haven't come across them before a whoopie Pie is a hybrid/mix between a scone, biscuit and a sponge cake. 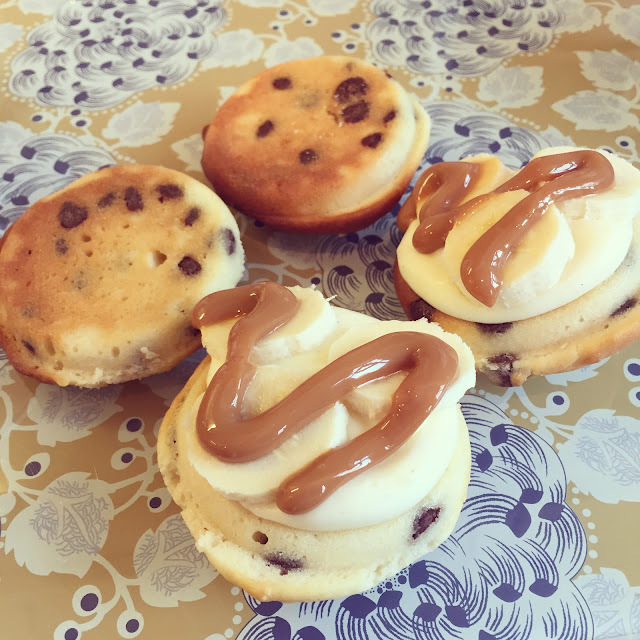 These little cake discs are sandwiched together with combinations of delicious fillings - in this case: cream cheese frosting, sliced fresh banana and caramel. WIN! Preheat the oven to 180℃ (fan 160℃)/350℉/gas 4. Lay the whoopie pie tray on a baking sheet. Stir the buttermilk and lemon juice together. In a mixing bowl, beat the b utter and sugar until light and fluffy. Beat in the egg, sieve in the flour and stir in with the milk. Finally, add the buttermilk mixture and fold in with the chocolate chips until evenly mixed in. Weigh your total batter and divide that number by 18 (mine was 52g per shell). 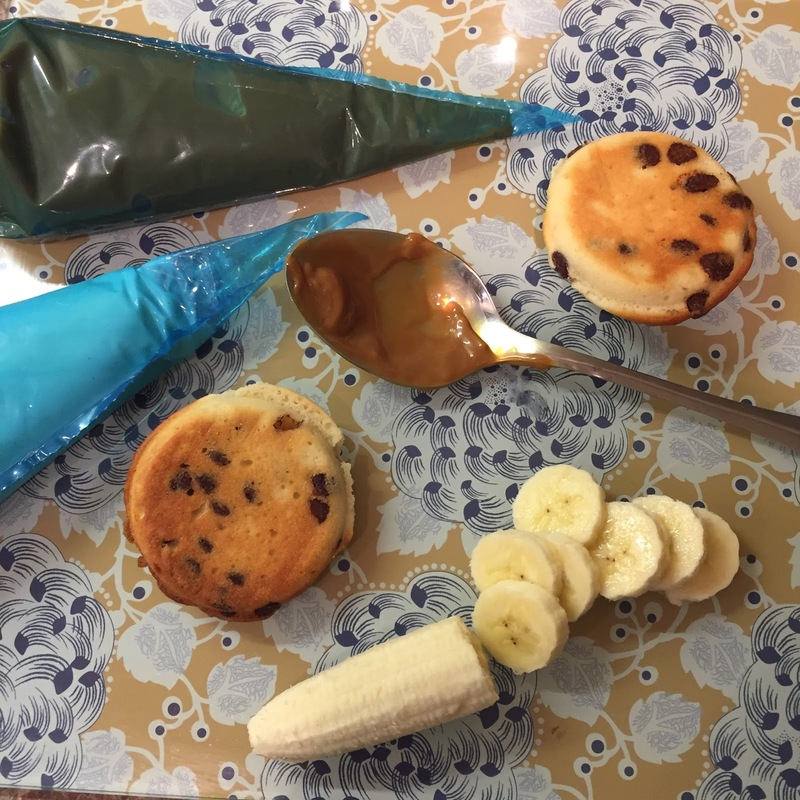 Weigh out spoonfuls of your batter and place into the cups of the tray until your first 6 are ready to bake. Bake for 10-12 minutes until spongy to the touch and golden brown. Leave to cool in the tray for 5 minutes before lifting off and placing on a wire rack to leave to cool completely. Wash and dry the whoopie pie mat (important - to stop sticking!) and use the remaining batter to bake more shells the same way - you need 18 in total. Beat the butter until it is pale and creamy. Add the cream cheese and beat until it is evenly combined with the butter. Gradually beat in the icing sugar on a slow speed, scraping down the sides of the bowl as necessary. Add the vanilla and beat for a further 5 minutes. Spoon the filling into a disposable piping bag fitted with a large star nozzle (Wilton 5M is best) and pipe the filling over the flat side of one half of the whoopie pie shells. Add the banana slices and place the other half shells on top. Heat the sugar in a heavy-bottomed saucepan over a low heat until melted. Boil, without stirring, until a rich caramel colour. Remove the pan from the heat. Warm the cream in a small bowl in the microwave and pour it into the caramel in a thin, steady stream. Add the butter and stir until it has melted. Put the pan back over a low heat and whisk hard to dissolve any lumps of caramel. Pour the caramel into a bowl and leave to cool. 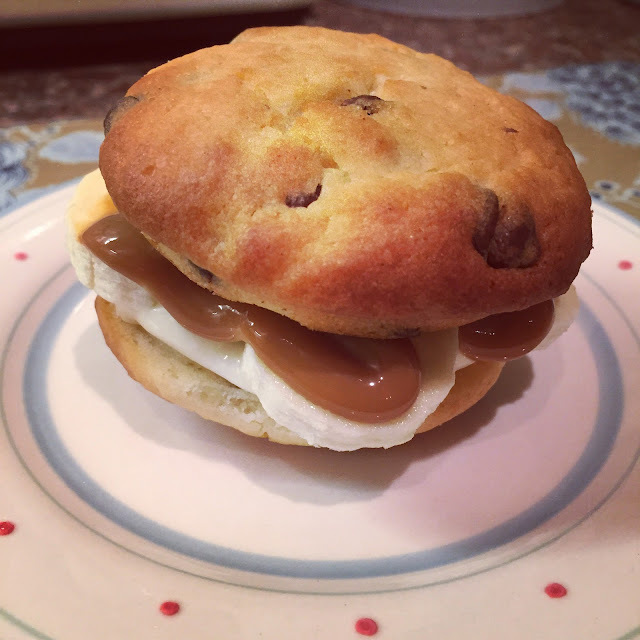 Drizzle the caramel over the whoopie pies using a teaspoon or piping bag. 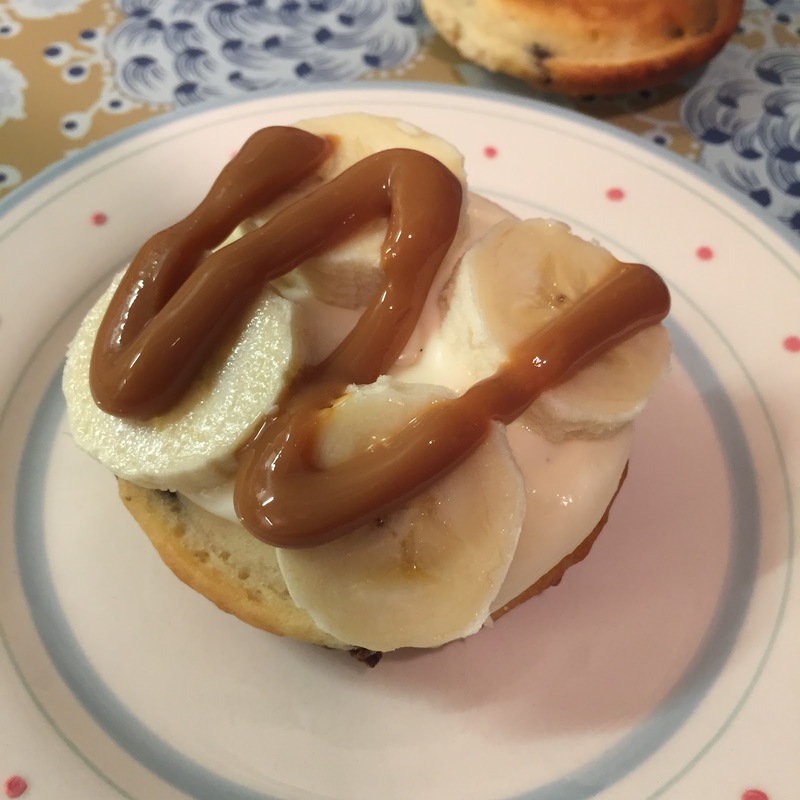 Banoffee - the best flavour combo in the world?? T'ah D'ah! Banoffee Whoopie Pie ready for devouring! All of my taste testers absolutely loved these whoopie pies - most of them had never tried one before, so it was cool to take their whoopie-pie virginities and see them enjoy the fruits of my labour. 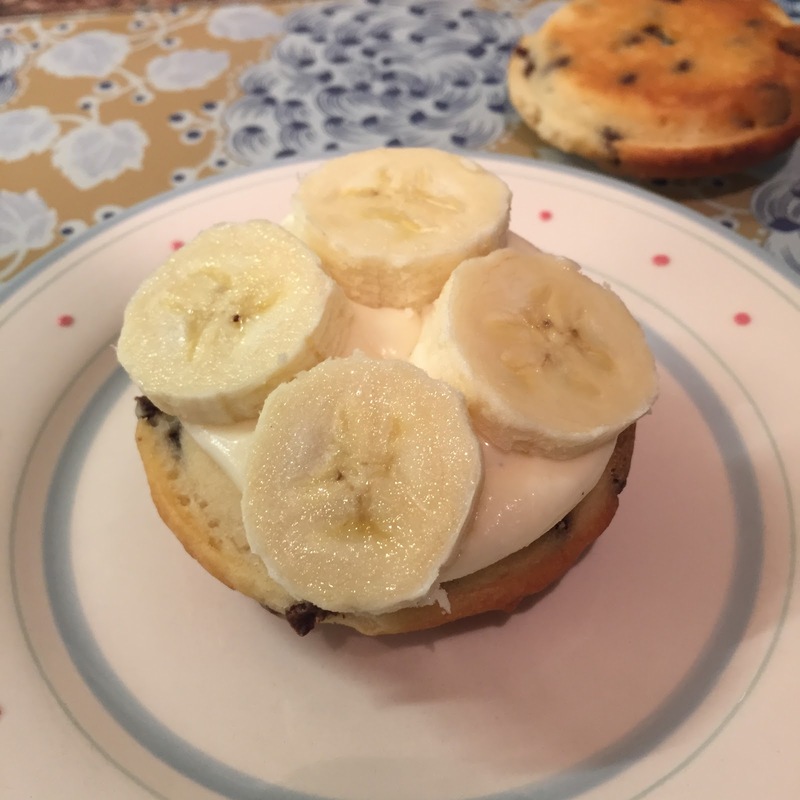 Unfortunately for me, I was in the final days of my #SugarFreeSeptember challenge so I couldn't try them *SOBS*...absolute dedication to the challenge - I didn't even lick my finger when I was making the cream cheese frosting, if that's not willpower then I don't know what is? 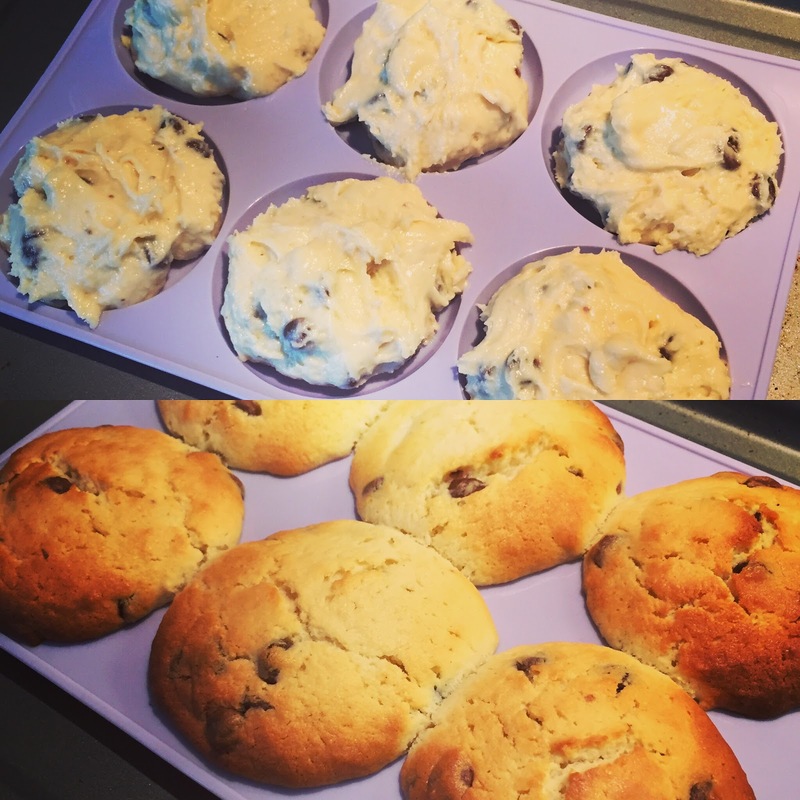 I'm rest assured they were very tasty and so I will definitely be making them again soon so that I can have a taste. Another fabulous box from Bake Box, six brilliant recipe cards (I can't wait to have a go at all of them - mini doughnuts next! 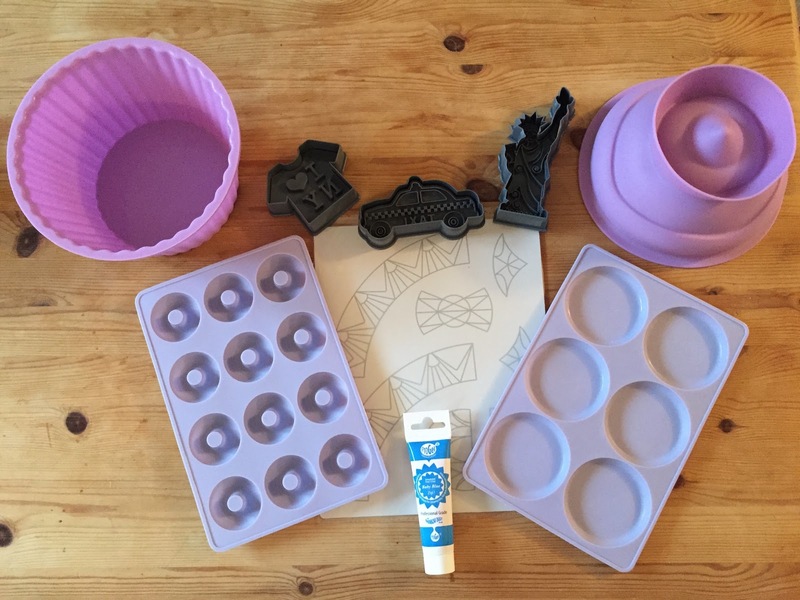 ), really high-quality bakeware which make exciting additions to my baking cupboard and just an all-round fun time...I wonder what my next box will have in store? Disclaimer: I was sent this Bake Box in exchange for a fair and honest review.